The LegalBlade™ App.includes all 50 states, the District of Columbia and over 40 cities. Additional city ordinances will be added continuously going forward. All data is maintained on the server to ensure users always have the most current information that is available to Knife Rights. As more cities are added to the database, they automatically become available to the LegalBlade™ App. This app was created courtesy of a donation to Knife Rights Foundation. The nominal $1.99 charge for the app will to ensure Knife Rights can update the LegalBlade™ App with any changes in the law, add more cities and improve the app with additional features going forward. 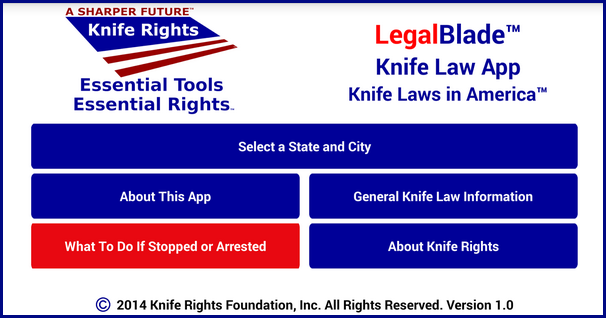 The Knife Rights LegalBlade™ App IS FOR INFORMATIONAL PURPOSES ONLY and DOES NOT PROVIDE LEGAL ADVICE. Users are cautioned not to rely on the information provided by the LegalBlade™ App as an alternative to legal advice from a licensed attorney.